After the TK80, TK82 and TK83 the TK85 was the last ZX-81 compatible machine Microdigital produced in1984. I’ve used the TK85 computer for long time along with a long friend William Douglas. We used to spend numerous hours typing programs from the early computer magazines into this machine to see the results in a black and white TV next to the bed. Mix this with caramel condensed milk and you can pretty much describe a great portion of my young years. I have to say however that TK85 wasn’t only a simple copy of the ZX-81 but featured several useful enhancements. Its rubber keyboard and case were similar to the Spectrum’s and were much more pactical for intensive use. The 10 KB ROM held an improved version of the Sinclair’s Basic with strings management and editing facility, as well as some primitive graphic commands. 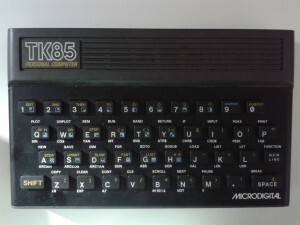 Thanks to the TK85, Microdigital started to lead the Brazilian home computer market, front of Sinclair and its US branch, Timex. By the size of a book, it had a Z80 processor, 16k of RAM, certainly no hard disk. The case was made of molded ABS plastic and the multi-function keys were probably made of rubbery polyurethane. It measured 23 x 14,5 x 4 cm. While these things might be considerably antiquated now – any cheap phone have more power than this old computer – it really made a big difference in learning step by step as it was built. I tend to say that our generation which actually lived the technology growth have an inside knowledge new students are lacking of. Knowing the why of certain things can make a big difference instead of civilization – including computer technicians – being transformed into a “mouse click robots”. People don’t seem to be interested anymore in understanding why and how, just assuming it works. This can be considerably dangerous to newer generations.